Do you have dismal results from your direct mail campaigns? As a small business owner, it can be frustrating to spend time and money on a postal mailing and not understand why it failed to deliver. If you want to increase your postal mailing response rates, I recommend you follow these 12 proven tactics. Know your objective. Do you want customers to place an order, call you, visit your website, or return a reply card? Create an eye-catching design or theme for your campaign. Use the same theme for every piece in the campaign. Explain the benefits rather than listing the features. Make the greeting personal. Use a system that will address the recipient by first name, like SendOutCards does. (See info below). Use short bullets points rather than long paragraphs.Include a clear and enticing call to action with your contact information, with an incentive to act immediately. Offer a discount, free sample or special offer.Use a high quality targeted mailing list. A series (as many as 7 to 10 pieces) will produce exponentially higher results than a single piece. To keep costs down, try using postcards. Create an emotional and attention-grabbing headline. Offer a solution to your prospect’s problem. Use a glowing testimonial with the client’s name, company and city. Emphasize your brand and make sure it is consistent with your other marketing materials. Write in a personal and friendly style. 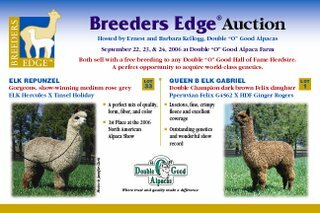 This is the first postcard of a 3-part campaign I designed for Double “O” Good Alpacas. 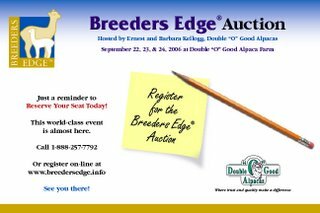 This series was for the “Breeders Edge™ Auction. 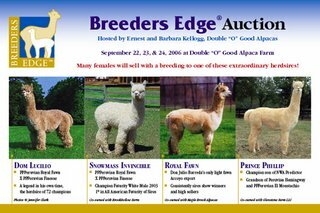 These are the 2nd and 3rd cards in the series I designed for Double “O” Good Alpacas. Notice how the branding elements, colors, fonts and overall theme are consistent in all three postcard designs.